Pricing has been announced for the much anticipated water-cooled R 1200 GS. The all new feature packed machine will retail for $21,250 plus on road costs**. The “wasser boxer” comes equipped with ABS (switchable), chrome exhaust, heated grips, hand protection, tyre pressure control, white LED indicators and pannier fastenings and can be optionally delivered with ESA (Electronic Suspension Adjustment), ASC with riding mode system, LED headlight and daytime riding light, wire spoke wheels, cruise control and alarm other options and accessories. There is also the ex-factory option of low suspension. 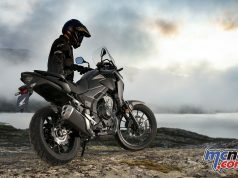 The new R 1200 GS is the latest in GS models that have lead the way in the adventure touring class for over thirty years. Delivery of the R 1200 GS will commence in late March. ** Manufacturer’s Recommended List Price is shown and includes GST but excludes dealer charges, stamp duty, statutory charges and on-road charges, which are additional and vary between dealers and States/Territories. Customers are advised to contact their nearest BMW dealer for all pricing inquiries. 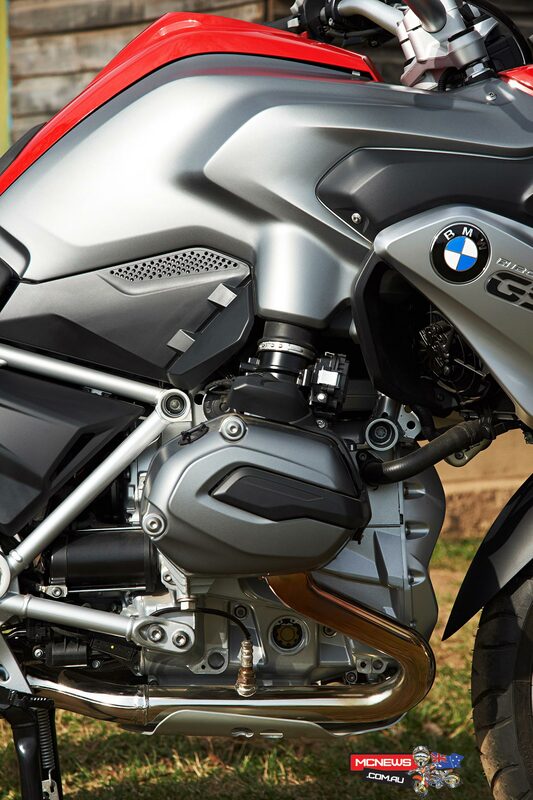 Their are few unlikely success stories as far fetched as BMW’s big GS and its Boxer engine. The current R 1200 GS is in its ninth year of production and more than 170,000 have been sold in that time. By and large the R 1200 GS is still the benchmark in adventure-touring when all facets of performance are measured, despite a slew of new competition in recent years trying to steal its crown. 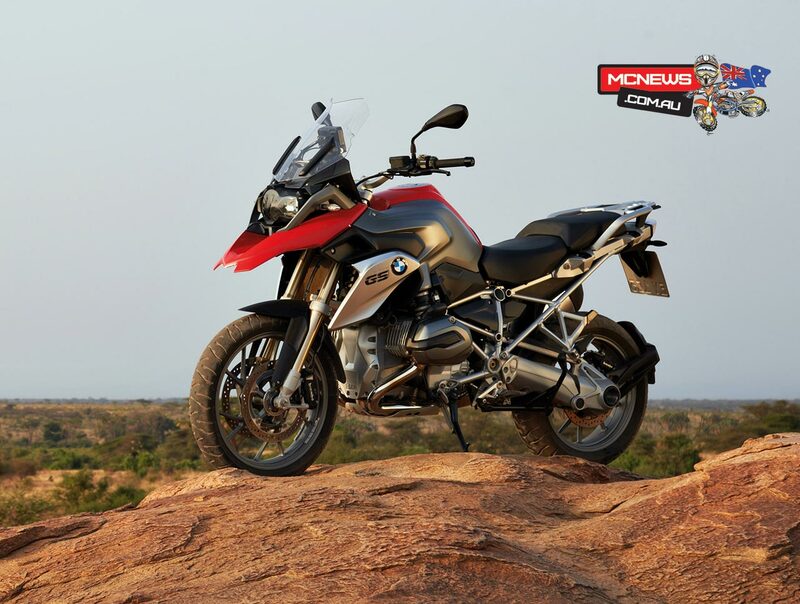 – Completely newly designed engine for top-level riding dynamics within the adventure segment. – Capacity 1170 cc, rated output 92 kW (125 bhp) at 7700 rpm and a maximum torque of 125 Nm at 6500 rpm. – Cylinder heads with vertical through-flow for increased efficiency and performance. – Compact air/water cooling for optimum heat management. – Basic engine with compact, light and yet rigidity-optimised crankshaft. – Vertically separated case in open deck construction. – 6-speed gearbox integrated in engine housing, including wet clutch with anti-hopping function and reduced lever operation force. – New intake system for optimum output and torque with 52 mm throttle valve diameter. – Freely selectable riding modes “Rain”, “Road”, “Dynamic”, “Enduro” and “Enduro Pro” with three different electromotive throttle actuator settings in conjunction with ASC (Automatic Stability Control), ABS and ASC settings for off-road riding as well as different mode-specific Dynamic ESA settings (option ex works). – New suspension with torsionally stiff tubular steel bridge frame and bolt-on rear frame. – Optimised lightweight cardan shaft drive now running on the left-hand side. – Newly developed and optimised Telelever at front and EVO Paralever at rear for an even more precise ride feel. 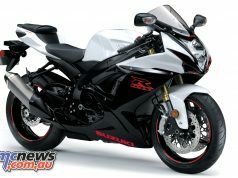 – Refined master chassis geometry data and long swingarm for excellent traction. – Optimised seating width and position, and adjustable handlebars for even greater comfort. – Optimised ground reach for rider (inner leg length). – Tyre/wheel dimensions of 120/70 R19 at front and 170/60 R17 at rear as a world first, tailored specially to the R 1200 GS. – Revised BMW Motorrad brake system with radially mounted Brembo Monobloc brake calipers at front and 2-piston floating caliper with enlarged brake disc at rear (276mm, previously 265mm). BMW Motorrad Integral ABS as standard. – Semiactive suspension Dynamic ESA (ex works option). – Main headlight with optimised light efficiency and LED daytime running light (ex works option). – World’s first motorcycle with LED main headlight featuring integrated daytime running light (ex works option). – New vehicle electrical system with partitioning of functions. – Extended electric switch units. – Electronic cruise control (ex works option). – Preparation for navigation unit with Multi-Controller to operate the BMW Motorrad Navigator IV (ex works option). – Windshield with one-hand operation for excellent wind and weather protection. – Seat with multiple adjustment functions for perfect ergonomics. – Number plate carriers quick to dismount for off-road riding. – New instrument cluster with on-board computer as standard. PRO on-board computer as an option. — The new BMW R 1200 GS – Completely newly designed engine for maximum riding dynamics in the large capacity adventure segment. Designed to perpetuate the almost 90-year tradition of the BMW boxer engine with a future-oriented concept created to hold good for years to come, the engine reproduces numerous classic engineering features but also offers a wealth of new technical solutions. With its completely redesigned engine BMW claim it delivers a much higher level of dynamic performance, acceleration and pulling power across the entire engine speed range, both on the road and over rough terrain. The boxer engine in the new R 1200 GS continues to use air/liquid cooling but the oil coolant has been replaced by a glycol water mixture for the first time in a BMW Motorrad boxer engine. This ensures a high level of heat absorption capacity of the coolant for more efficient heat dissipation. So-called precision cooling means that the cooling fluid flows through the thermally more heavily exposed engine elements – the two cylinder heads and parts of the cylinders. Heat dissipation is via two radiators positioned at the left and right of the front section. These are inconspicuously integrated and well protected by the radiator covers. An electric fan behind the right-hand radiator is automatically activated as needed, controlled by the thermostat – for example at high outdoor temperatures in city traffic. Thanks to the sophisticated cool-air ducting on both sides, the warm air is streamlined past the rider. The engine still also uses air cooling which reduces radiator size and preserves the characteristic appearance of the boxer engine. 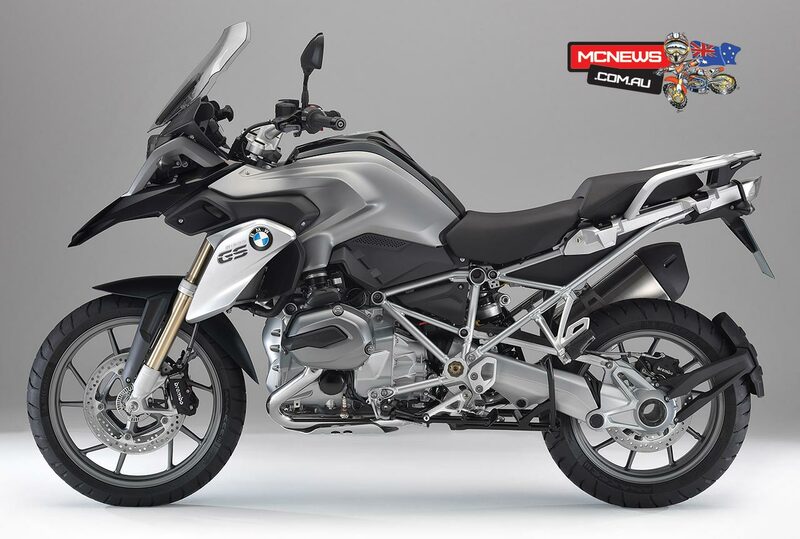 With the new very compact cooling system, it has been possible to significantly improve the cooling ratio and thus the heat management system as compared to the predecessor model (22 % oil cooling / 78 % air cooling) in the new BMW 1200 GS (35 % liquid cooling / 65 % air cooling). The new liquid cooling adds weight to the vehicle as compared to the previous air/oil cooling system, but due to its very compact size and high efficiency, this is only a very moderate addition of approx. 2.7 kilograms. The engine of the new BMW R 1200 GS has vertical through-flow unlike all previous standard BMW Motorrad opposed-twin engines. The advantage is that the design of the intake channel no longer depends on the camshaft control, so it was possible to realise identical intake lengths for both cylinder sides. What is more, the fuel injector in the intake port is now arranged so that the fuel can be injected as squarely as possible in front of the intake valves for optimum carburation. The result is a higher level of power and torque efficiency across the entire engine speed range as well as improved fuel efficiency. As in the predecessor model, the two camshafts made of heat-treated steel are arranged horizontally. By changing the through-flow direction from horizontal to vertical, however, it is now possible to have purebred intake and exhaust camshafts – in the predecessor model these were combined intake/exhaust camshafts. This also opens up the possibility of adding variability to the valve gear in future. Newly calculated cam profiles allow a reduction of overlap time without impacting on performance. As before, the two respective camshafts are driven by a chain running in the shaft behind the cylinders (on the right-hand side of the engine from the counterbalance shaft and on the left from the crankshaft). The timing chain drives an intermediate shaft between the intake and exhaust camshaft and it is from here that power is transmitted to the camshafts via spur gear pairs. At each exhaust camshaft there is an centrifugal-force-driven decompression facility which facilitates the start-up process. This makes it possible to save weight in the starter motor and battery. Compared to the hitherto horizontal through-flow of the cylinder heads, the vertical through-flow permits an optimally straight intake port with a correspondingly simple chain guidance of the camshaft drive. Due to the highly efficient overall design of the power unit, the previous radial valve arrangement is no longer required. At 8 degrees on the intake side and 10 degrees on the exhaust side, the four valves are at close angles to one another, making for a compact combustion chamber shape – a feature which is crucial to optimum combustion. Due to the new calculation of the combustion chamber and the much improved channel ducting and design, it has been possible to improve the compression ratio as compared to the predecessor model from 12.0:1 to 12.5:1. What is more, due to the optimisation of the combustion process and ignition timing, no knock control is required, despite retaining the RON 95 set-up, while still making the most of torque potential. The use of a turbulence system (air feed via a bypass) ensures optimum combustion, obviating the need for an elaborate dual ignition. The plate diameters of the valves have also been redefined to obtain higher output and torque efficiency. They are 1.0 millimetres larger, with a size of 40 millimetres on the intake side and 34 millimetres on the exhaust side. The valve stem diameter is still 5.5 millimetres as before. Significantly shorter valve springs do justice to the increased engine speed level, while also ensuring an optimally defined drag effect. As before, the valves are operated via light, speed-resistant rocker arms, the design of which was derived from the high-performance 4-cylinder engine of the BMW S 1000 RR. The valve clearance settings are made by means of replaceable shims. With 0.10 to 0.17 millimetres on the intake side and 0.34 to 0.41 millimetres on the exhaust side, valve clearance levels are just below those of the predecessor model. The crankshaft has also been completely re-engineered. The main bearing diameter was reduced from the previous 60 millimetres to 55 millimetres to reduce the drag forces. The crankshaft also has crankpins which are narrower but with a diameter enlarged from 48 to 50 millimetres as well as narrower main and guide bearings. As a result, it is lighter overall yet much stiffer and more compact. Although the boxer principle, with its opposed cylinders, offers mutual cancelling out of the free mass-forces (due to the rods and pistons moving back and forth), there is still a certain amount of residual vibration. This results from the unavoidable parallel offset of the two cylinder axes, meaning that the forces do not act precisely on the same level and resulting in a so-called rotating mass moment of inertia. This rotating mass moment of inertia has been significantly reduced by means of a more compact crankshaft design, but it was not possible to eliminate it completely. As in the existing boxer engine of the R 1200 GS, the new engine therefore also has a counterbalance shaft which runs at crankshaft rotation speed with newly defined imbalance masses so as to eliminate unwanted vibrations. The counterbalance shaft is designed as a hollow intermediate shaft within which the clutch shaft runs. This ensures that the new engine of the R 1200 GS, with its higher engine speed level, runs more comfortably and with perceptibly less vibration across the entire engine speed range and at high engine speeds in particular. Nonetheless, the essential earthy boxer characteristics are still preserved. Vertically separated case in open deck construction – For the first time in a BMW Motorrad boxer engine, the cylinders are no longer separately bolted to the crankcase, but are integrated directly. The dual-section die-cast cylinder crankcase with vertical split level at the centre of the crankshaft is made of highly rigid aluminium alloy. The two case halves form a highly rigid composite consisting of the cylinder and the bearing block for the crankshaft. The cylinder with cooling jacket is designed in open deck form. The liners are coated with a low-wear and low-friction iron-carbon alloy using the new wire arc spray process (LDS) already used for BMW automobile engines. For the first time in the history of BMW Motorrad, the gearbox and clutch are integrated in the engine housing of a boxer engine. This provides benefits in particular in terms of weight balance due to the omission of numerous bolt connections and sealing surfaces, but also in terms of the torsional response of the unit as a whole. In addition to saving space and weight, the new gearbox (two transmission shafts, one drive shaft, one output shaft) means there is no longer any need for the additional transmission oil volume previously required for lubrication. The six-speed gearbox of the new R 1200 GS was also redefined to meet the demand for light, precise shifting and optimum gearshift connections so as to achieve excellent riding dynamics. As a result, the ratios were newly calculated. As before, a helical gearing system is used for the gearwheels which ensures low running noise and a high level of running smoothness due to smooth tooth engagement. As before, the gear shafts of the new engine are mounted on anti-friction bearings and the gearwheels (idlers) run smoothly on needle roller bearings. Shifting of the gearwheels and therefore of the gears is effected by means of a ball-bearing mounted selector drum made of steel, three case-hardened gearshift forks with hard chrome-plated ends and sliding sleeves with force-fitting connections between the gearwheel pairs. The new R 1200 GS is the first serial production BMW Motorrad boxer motrcycle to have a multiplate wet clutch with eight friction discs instead of the previous single-disc dry clutch. The benefits of this solution lie in the reduced moment of inertia, on the one hand due to the significantly reduced external diameter of 147 millimetres (R 1200 GS previously: 180 mm), but also in its more compact size. For the first time in conjunction with a boxer engine, the clutch system is fitted with an anti-hopping mechanism. 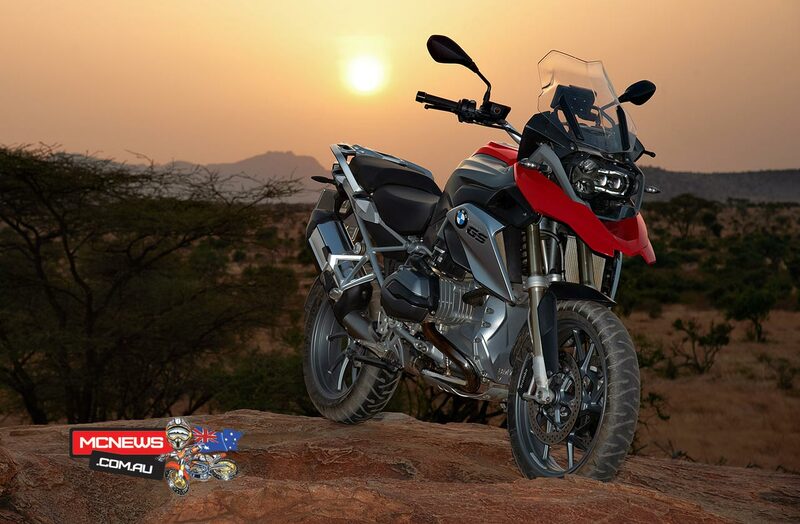 Here, BMW Motorrad especially addresses the needs of ambitious riders of the new R 1200 GS travelling on country roads. The brake torque of the engine is now passed to the rear wheel at a reduced level during coasting. This prevents brief blocking or hopping of the rear wheel due to the dynamic wheel load distribution when applying the brakes heavily and changing down at the same time. In this way, the motorcycle remains stable and safely controllable in the braking phase. Clutch disengagement during coasting is effected mechanically by means of a ramp mechanism. The clutch is activated hydraulically. The practically oriented level of hand force and finely sensitive controllability provided by hand force enhancement in the clutch ensure that the high standards of BMW Motorrad are met in terms of operation and comfort. In conjunction with the sensitive throttle response, this makes for optimum vehicle control on all types of terrain. For more than two decades now, BMW Motorrad has occupied a leading position in the field of electronic engine management, and in the case of the new R 1200 GS this is taken care of by the new digital engine control system, the so-called BMS-X. Its main features are fully sequential injection, a compact layout and low weight. The Alpha/n-based engine management system with torque interface draws on a wide range of parameters. For example, it enables perfectly controlled torque output and adaptation of response to a diverse range of conditions via the E-gas characteristics attributed to the various riding modes. The control system is based on the volume of intake air which is determined indirectly via the throttle valve angle and the engine speed. Based on additional engine and environmental parameters (including engine temperature, air temperature and environmental air pressure), the engine control system determines individually adapted levels for injection volume and ignition timing together with stored mapping characteristics and pre-set correction functions. Carburetion is taken care of by an electronic fuel injection system via a throttle valve body system with an opening width of 52 millimetres instead of the previous 50 millimetres. Newly designed, markedly raised intake air snorkels and a generously sized airbox with panel air filter element ensure optimum feeding of cool intake air and thus optimum filling. An electromotive throttle actuator system is used to control the two throttle valves. Here the rider’s commands are passed on directly from the sensor in the accelerator twist grip to the fully electronic engine control system and converted into a throttle valve position as appropriate to the riding mode selected by means of instant electronic adjustment. The electromotive throttle actuator in the new BMW R 1200 GS allows improved ridability and optimised running smoothness in the near-idling range since the engine control detects any differences between the two cylinders in terms of mean pressure and compensates by means of selectively adapting the throttle valve angles. Furthermore, in conjunction with the optional ASC and riding modes, different throttle response characteristics can be set (soft, optimum, direct) according to the intended purpose. Much improved controllability has enabled a reduction of twist grip angle from 85 to 70 degrees. Another advantage of this technology is the realisation of a cruise control function as a comfort option. Even the previous R 1200 GS offered top-level response, leaving virtually nothing to be desired in terms of handling, directional accuracy, steering precision and high speed stability. For this reason, the master chassis geometry has not been radically changed but merely slightly optimised. The steering head angle has increased slightly to 64.5 degrees. Wheel castor is virtually identical, having previously been 101 millimetres and is now 99.6 millimetres. The wheelbase of 1507 millimetres has remained unchanged. The length of the swingarm has been considerably increased. Previously 535.6 millimetres in length (measured from the swingarm centre of rotation to the middle of the rear axle), the new figure is 588 millimetres. In order to provide a fuller ride feel and more harmonious response, in conjunction with increased directional accuracy and performance when braking and accelerating, the wheel and tyre dimensions of the R 1200 GS were recalculated and defined over a number of highly involved development phases in collaboration with well-known tyre manufacturers. The tyre dimension 120/70 R19 is used for the first time ever in a large adventure bike. As compared to the previous tyre size of 110/80-19, the tyres for the weight-optimised 10-spoke light alloy cast wheel enlarged to 3.0 inches (previously 2.5 inches) offer a larger contact area, which has the effect of producing higher levels of transferrable cornering and deceleration forces. A special tyre contour tailored to the new R 1200 GS also guarantees maximum neutrality when cornering as well as the very highest level of riding precision. A newly defined tyre is also used on the rear wheel of the R 1200 GS to enhance traction, cornering and ultimately riding dynamics, too. While the R 1200 GS previously had a 150/70 R17 tyre at the rear, a size 170/60 R17 tyre now ensures a significantly larger contact surface for better cornering and traction. In keeping with the new tyre size, the rim width of the likewise weight-optimised 10-spoke light alloy rear wheel has also been increased from 4.0 to 4.5 inches. And in the R 1200 GS, too, the extensive BMW Motorrad options program allows these to be fitted with cross-spoke wheels, especially for increased off-road use. These have also been completely newly developed and are identical in size to the standard light alloy cast wheels. In the course of redevelopment, the light alloy rim was given a matt, robust and easily cleanable surface coating. The weight-optimised hubs boast a finely wrought technical design and are connected to the rim by stainless steel spokes. The BMW Motorrad brake system of the R 1200 GS – which like all BMW motorcycles is fitted with ABS as standard – has undergone extensive revision. Radially bolted Brembo Monobloc brake calipers with a piston diameter of 32 millimetres (previously: 34 and 36 millimetres) are now fitted. The diameter of the master cylinder of the handbrake pump has been reduced from 16 to 15 millimetres. The diameter of the two floating brake discs is 305 millimetres as before. The rear single disc brake still has a 2-piston floating caliper with a piston diameter of 28 millimetres. Meanwhile, the diameter of the brake disc has increased in size from 265 to 276 millimetres. The much slimmer waist of the new R 1200 GS in the knee grip area makes for further improved off-road manoeuvrability, much simplifying the act of riding while standing up. What is more, the shape of the fuel tank was calculated in such a way that the decrease in fuel tank capacity barely influences the centre of gravity of the new R 1200 GS, ensuring maximum consistency in terms of ride response. Ground reach for the feet was also improved due to the slimmer waist. The inner leg length is now 1870 mm at a seat height of 850 mm (-20 mm to predecessor model) or 1910 mm at 870 mm seat height (-30 mm to predecessor). For solo riding and for more active off-road riding the passenger footrests can now be dismounted quickly and simply complete with extensions. The new handlebars in double-butted aluminium tubing have increased in size in the mounting area from 28.5 to 32 millimetres. The enlarged diameter results in greater stability as well as increased torsional stiffness – achieved by greater surface pressure. Within the two clamps, the handlebars can now be twisted by 10 degrees, resulting in a change of grip height of 20 millimetres to adapt to the rider’s individual needs. BMW Motorrad has always attached particular value to refined ergonomics in the products it develops. After all, riders will only ride well if they really feel comfortable on their motorbike. For this reason, the seat of the new R 1200 GS is narrower in the front section for greater freedom of movement off-road, but has a broader thigh rest for tangibly increased ride comfort. What is more, it is adjustable to two heights (850 and 870 millimetres) as well as in terms of tilt angle. The passenger seat also offers a length adjustment function. The front position allows the passenger to select a seating position closer to the rider. It also provides a big enough gap from the topcase, allowing a leaning seated position for increased comfort. Closer contact between the rider and passenger supports ride stability and agility, and, when accelerating sharply, the rider benefits from a pelvis support on the passenger seat, too. Meanwhile the back position provides both rider and passenger with generous space. But BMW Motorrad also offers a range of alternatives here as part of its extensive range of special accessories. For example, there are adjustable, lower (820 mm) and higher (870 mm) seats as well as the rallye seat. The new generation of switches and hand controls is used in the R 1200 GS, as already introduced with the K 1300 series – though here with an extended range of functions. The function for the left and right turn indicators are clustered in a function on the left-hand side of the handlebars. The hazard warning flashers are activated via a separate switch integrated clearly visibly at the top of the left-hand handlebar panel. The functions for low beam, high beam and headlamp flasher are combined in a switch which is located near the left index finger for convenient access. The horn is activated with the thumb. The switch for activating the daytime running light and the rocker switches for trip/info and ABS/ASC/ESA are still placed at the left-hand end of the handlebars. Activation of the heated grips is integrated compactly and within convenient reach in the right-hand control unit. The position of the heated grip is displayed by means of symbols in the LCD display in the instrument cluster. The functions for starter and kill switch are conveniently combined in a rocker switch at the right-hand end of the handlebars. This guarantees that when the start button is activated, the kill switch is not left on by mistake, ensuring that the vehicle can be reliably started. The switch for pre-selecting the riding mode is also on the right. The new standard halogen headlight is not only considerably smaller than the previous one. In terms of road illumination, too, it offers top-level lighting technology for both low and high beam. Intensive tests in the BMW Group lighting tunnel have generated light levels which – given the same light emission area – achieve significantly better results in terms of perceptibility and vision for night riding as compared to the competition. 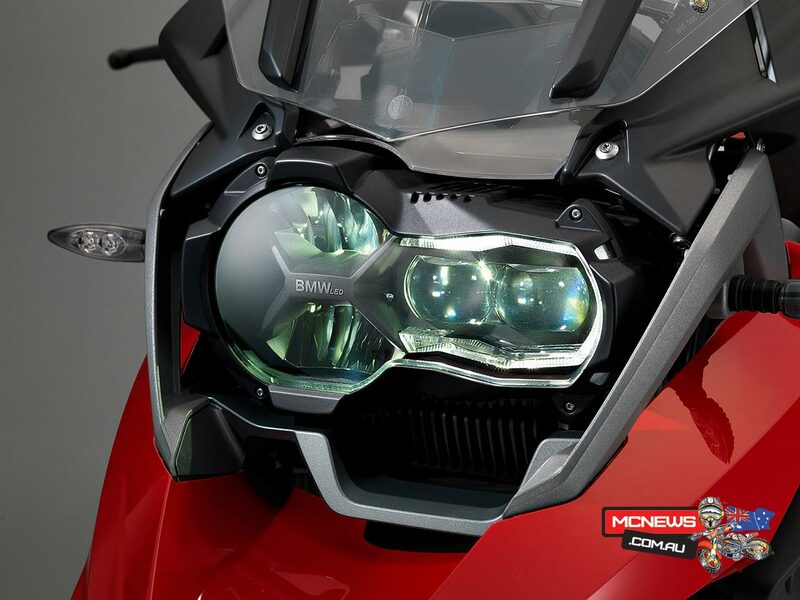 BMW Motorrad offers an additional daytime running light with LED technology as an ex works option. The unit consists of four LED modules and is integrated underneath the main halogen headlight. The daytime running light allows other road users to differentiate the motorcycle much more clearly, thereby offering a huge safety benefit. What is more, the use of LED technology means a lower level of energy consumption and an extended lifetime. The daytime running light is switched on either automatically via a light sensor or manually instead of the main headlight using the “Daytime running light” switch. When darkness falls or when entering a tunnel, there is an automatic switchover to the halogen main headlight, providing optimum road illumination to ensure excellent visibility. The latest example of the innovative power of BMW Motorrad in this area is the first ever full LED headlight with integrated daytime running light to be used in serial motorcycle production, available as an option for the R 1200 GS. Globally unique, this LED main headlight with daytime running function illuminates the road with a level of brilliant clarity not previously known. The headlight’s LEDs are strikingly distinctive and powerful with their double glass lenses. The option also includes a rear light with two light bands, making for an even more high-quality rear view. The switchover between daytime running light and low beam can be set to automatic in the instrument cluster menu. With daytime running switched on, the motorcyclist benefits from significantly increased perceptibility in the daytime and therefore increased safety. In addition, there is the striking look of the horizontal “U” which – like the light rings in the K 1600 models – will soon become an unmistakable trademark of the new GS. The light unit consists of two LED units each for low and high beam, as well as four additional LED units for daytime running light and side light. These are mounted on a central heat sink made of die-cast aluminium. Behind the heat sink there is an axial fan. An additional air ducting element directs the warm air onto the glass panel, thereby generating air circulation inside the headlight. This air circulation ensures decondensation of the headlight, also contributing actively to de-icing of the lens in winter. The new, more rigid main frame including the steering-head bearing for the Telelever and the swingarm axle of the EVO Paralever has made it possible to significantly improve ride stability, handling and precision. The bike also benefits from the improved suspension/damping set-up in terms of touring suitability, since lengthy trips are now more comfortable and less tiring for this reason. While the frame of the R 1200 GS previously consisted of an upper frame to support and position the Telelever and the rear frame with integrated swingarm mount and welded on rear section, the chassis of the new R 1200 GS is now made of a continuous steel bridge frame with a bolt-on rear frame. The latter offers particular benefits in terms of maintenance. However, the integration of the engine as a load-bearing element has been retained as this is beneficial to the bike’s weight and rigidity. As before, the triangular swingarm in forged aluminium is supported by the engine housing. The outstanding underlying principle of this type of front wheel control is the fact that it relieves the telescopic control of longitudinal and transverse forces as well as separating wheel control from suspension and damping, resulting in an unsurpassed degree of sensitivity of response in the front section. A high level of ride precision and directional accuracy combined with excellent ride comfort and anti-dive control are the fundamental advantages of this design. The Telelever has been geometrically refined for use in the new R 1200 GS, and its excellent properties have been further optimised. While retaining the same degree of rigidity, the fork tube diameter of the telescopic control was reduced from 41 to just 37 millimetres. This means that in spite of integrating radiators in this area, it was still possible to retain the existing steering angle of +/- 42 degrees, ensuring excellent manoeuvrability and slow riding. In combination with a more rigidly designed trailing arm, the overall result was even higher steering precision and transparent feedback in the front section. As before, the entire Telelever is designed to be maintenance-free with its encapsulated ball joints and permanent lubrication as well as a lifetime filling of the telescope tubes with oil. In the patented rear wheel control system EVO Paralever it was possible to provide improved protection for the lower spring strut area against potential damage during off-road riding by means of the wrap-around swingarm. Due to its more rigid housing in the main frame, the progressive damping spring struts at front and rear now respond much more sensitively as well as having considerably increased damping reserves. With progressive damping, the progression of the damping force depends on spring travel. On the one hand, it enables a very finely tuned response even to the smallest road bumps, yet it still offers plenty of potential for off-road use with harsher impacts and ground waves. In spite of the much enlarged swinging arm length, the torsional stiffness of the Paralever is the same as in the predecessor model. At 190 and 200 millimetres, the spring travel at front and rear remains identical to the predecessor model. The share of positive and negative spring travel also remains the same. It is 122 to 68 millimetres at the front and 135 to 65 millimetres at the rear. The rear spring strut has 12 rebound-stage damping adjustment settings and also a handwheel for adjusting the spring mount (“spring preload”) so as to enable continuously variable hydraulic adaptation to the personal needs of the rider. 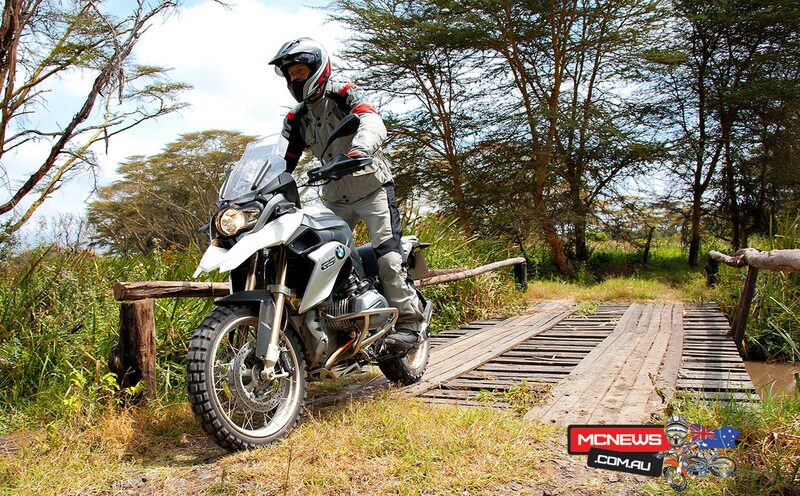 The new R 1200 GS also meets the need for greater off-road suitability by offering increased ground clearance. This is now 195 millimetres – 8 millimetres more than before. The increased ground clearance was not achieved by extended rebound travel in the wheel control, but by adapting the conception of the vehicle as a whole. With the optional Dynamic ESA, BMW Motorrad offers an electronic suspension which taps into a whole new range of possibilities as well as providing maximum riding safety and performance. This semiactive suspension monitors the vertical movement of front and rear wheel control in travel and speed as well as other parameters by means of a spring travel sensor in each position and adapts the damping automatically to the situation depending on riding conditions and the manoeuvres being carried out by the rider. Dynamic ESA also responds to an ABS control brake manoeuvre, for example. Damping adjustment of the spring struts at front and rear is effected by means of electrically controlled regulation valves. Dynamic ESA does not work as a self-contained system, but is able to communicate with the other control systems of the R 1200 GS – BMW Motorrad ABS as well as Automatic Stability Control ASC – via CAN bus. What is more, the basic settings of Dynamic ESA are linked to the riding modes “Rain”, “Road”, “Dynamic”, “Enduro” and “Enduro Pro”, which can be conveniently selected by the rider at the press of a button. Each of the riding modes gives the rider a damper setting as recommended by BMW Motorrad experts. The mode switch can be used to adapt the overall characteristics of Dynamic ESA, engine control (characteristics), ABS and ASC to the given situation by selecting the various modes with their respective settings. What is more, the damper setting can be tailored to personal preferences in all modes, ranging from “soft” to “normal” and “hard” by means of the “ESA” switch on the end of the left handlebar. The load settings for one person, one personal with luggage or two persons are also set using this switch, just as the rider prefers. In “Rain” mode, the dampers have a soft basic set-up. In order to ensure maximum safety when accelerating, ASC is set for early control intervention in “Rain” mode. ABS is adjusted for use on the road. If the rider selects the “Road” mode, Dynamic ESA shifts to a tighter setup. ASC ensures optimum traction on dry roads and the ABS is also configured for road use. In “Dynamic” mode, Dynamic ESA provides an even tighter damper setting which is entirely geared towards a sporty style of riding on the road. In this profile, ASC characteristics are further tightened, even enabling experienced riders to perform light drifts. Here again the ABS setting is geared towards road use, while also providing a more dynamic throttle response. The “Enduro” mode provides a high-traction damper setting for off-road riding. Here ASC provides for more slip on the rear wheel, allowing light off-road drifts. The ABS setting is designed for running over loose surfaces such as gravel with road tyres, which have a higher approved level of slip. As on the road, the ABS operates with a part integral function: in other words when the front wheel brake is activated, part of the brake force is directed to the rear wheel. This is a feature which offers a high level of safety over rough terrain, too. Here the control strategy is designed so that wheel lock is prevented while still allowing effective deceleration. Increased ride stability and a greater sense of trust are the pleasing result. An additional coded plug enables the rider to access the “Enduro Pro” mode for more ambitious off-road riding. This setting provides significantly increased bottom-out reserves. In this mode – reserved solely for off-road use with knobby tyres – experienced motorcyclists can deliberately make the rear wheel of the R 1200 GS break out due to ASC intervention adjusted to very experienced off-road use. The ABS characteristics are specially adapted to this type of sporty use since control is specifically geared towards riding on loose surfaces with studded tyres. What is more, ABS does not act on the rear wheel when the rear brake is applied. Deactivation of the part integral function means that the front and wheel brake operate entirely separately from one another, in keeping with the preferences of an experienced off road rider, also allowing so-called initial brake drift before hairpin bends. And when the coded plug is used, the individual Dynamic ESA setting is preserved over a change of riding mode. Without the coded plug all settings are set to default, e.g. when turning off the ignition. ABS and ASC can be manually disengaged by the rider in all modes. With the coded plug inserted, the systems remain deactivated when restarting the bike after having turned off the ignition before. In contrast to all previous BMW Motorrad boxer models, the swingarm with integrated cardan shaft drive and EVO Paralever (in its third generation and designed using the very latest calculation methods) is now positioned on the left-hand side. This avoids any contact between the rider and the hot exhaust system when pushing or getting on and off the machine. Another pleasing effect relates to the appearance of the vehicle: when the motorcycle is on the side stand there is now a clear view of the redesigned rear wheel. A newly calculated set of bevel/crown gears for the drivetrain meets increased output and torque requirements. In the tried and tested manner, the Paralever swingarm decouples the unavoidable reactive torque of the drivetrain from the swingarm and therefore from the suspension/damping system by means of an additional joint between the rear axle cover and the swingarm. This effectively eliminates the undesirable “elevator effect”, i.e. the rising and lowering of the rear when accelerating and decelerating. As part of the complete redesign of the drive system, there has also been a comprehensive reduction of clearance from the primary drive to the drivetrain, causing the enhanced engine performance to act more directly on the rear wheel. — The new BMW R 1200 GS – Technical specifications.